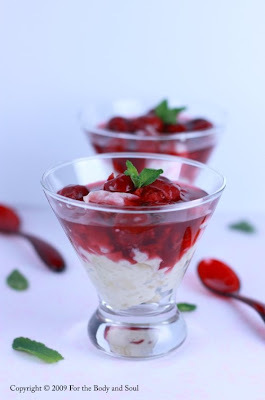 Today’s recipe is a rice pudding served with warm cherry sauce at Christmas time in Denmark. Apart from flaked or chopped almonds, one whole almond is added to the rice. The person, who finds the almond, should save it discreetly until everyone finishes the desserts. Only then, the almond is revealed and the person receives a little gift. Now, you might wonder why I make a Danish Christmas dessert at this time of the year. It’s all cause of Kiiri, a Polish girl, who has organized a food blog event featuring Scandinavian recipes. I didn’t follow a particular recipe for this pudding. Reading dozens of recipes on food blogs and other food pages, I have noticed that all of them call for the same ingredients: milk, rice, whipping cream, almonds, vanilla and a little bit of sugar. The quantities of the ingredients have varied from recipe to recipe, but that was actually a good thing as I could adjust them according to my taste. Also, the method of cooking the rice was different in different recipes. Old recipes asked for bringing the rice to boil, removing it from the heat, wrapping the pot in newspapers and blankets and leaving it this way for about 2-2.5 hours or until the rice is cooked. More modern versions just simmer the rice on a very low heat for about 1 hour. Since I have a “keep warm” function on my cooker, I decided to make use of it. I cooked the rice on a low heat for 10 minutes, brought it to boil, removed from the heat and left the pot with the rice covered on the “warming center” on my cooker for about 1 hour. 1. Split half of the vanilla pod lengthways, scrape out the seeds. 2. Place the milk and vanilla in a heavy-bottomed pan. Bring to a boil. 3. Reduce the heat. Add the rice gradually stirring constantly. 4. Increase the heat and bring to a boil again. 5. When the milk boils, reduce the heat, cover and simmer on a very low heat for about 1 hour or until the rice is cooked. Stir from time to time, making sure that the rice doesn’t stick too much to the bottom. 1. Place the cherries in a medium saucepan. Add lemon juice, sugar and 1 ½ cup water. Add the vanilla pod. Simmer until the cherries are tender. 2. Combine the potato starch with 2 tbsp cold water. 3. Bring the cherries to a boil. Remove the vanilla pod from the pot. Reduce the heat, and , stirring constantly, slowly pour the water with the starch. Simmer for a few minutes until the sauce thickens slightly. 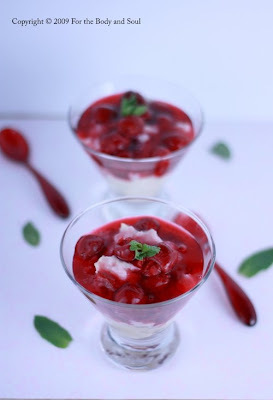 * I used frozen sour cherries in this recipe, but regular sweet cherries should work as well. It basically says that you write and pick your recipes with your heart and soul into it, which makes it a beautiful blog and a wonderful read! Mmmmmmmm, can I have this for breakfeast instead of my usual ?